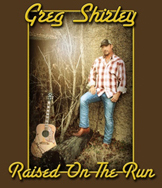 CHATTANOOGA, TN – Chattanooga-based label Garage Door Records announces a March 17 release date for Raised on the Run, the debut album from country music singer Greg Shirley, and will also release his new single, "The Good Drugs," on February 17. Raised on the Run was produced by T.W. Cargile and Greg Shirley. The album's title reflects his upbringing during the Shirley family's long travels up and down the American southern highways. It was the soundtrack of the music on the car radio and in the beachfront towns all along the coastline from Texas to North Carolina that formed the basis of his musical influences. Greg Shirley will perform many of the songs from Raised on the Run at the upcoming Country Radio Seminar in Nashville as part of the "Spin Doctors Showcase" set to take place on February 26 at the Hard Rock Café, starting at 9:00 PM. (Garage Door Records lablemate Justin McCorkle will also perform on the showcase.) Playing guitar in the backing band at the showcase will be Jimmy Dormire, former long-time guitarist for the Grammy nominated Confederate Railroad, who currently has a recurring role on the hit TV series, Nashville. He will also accompany Greg Shirley when he plays Chattanooga's prestigious Riverbend Music Festival in June. Greg Shirley released "Hillbilly Girl," the debut single and video from the new album, back in October 2014. The "Hillbilly Girl" single was written by Jason Blaine McEwen and Willie Mack, and its video, directed by Lance Goodman for The Beauty of Music Productions, perfectly captured the upbeat, fun-loving spirit of the song. Supporting the Alabama-based Shirley on Raised on the Run is a virtual "who's-who" of Nashville players. Keyboardist Jim Moose Brown is a veteran multi-instrumentalist who has lent his talents to recordings from Waylon Jennings, Brad Paisley, Alan Jackson, and Bob Seger. Drummer Eddie Bayers has earned the prestigious Academy of Country Music Drummer of the Year award for eight years straight. Bassist Kevin "Swine" Grantt's resume includes work for Toby Keith, Brad Paisley, Colt Ford, and Willie Nelson. Co-producer and engineer T.W. Cargile recorded Greg's vocals at Jamey Johnson's Big Assed Studio in Nashville. The co-producer of Johnson's Grammy-nominated "In Color," Cargile's track record with Alabama-based songwriters has long-been acknowledged. In addition to Greg's own compositions, Raised on the Run includes songs from some of Nashville's most celebrated writers, notably Bernie Nelson and Chris Wallin. Kenny Chesney, Chris LeDoux, and Randy Travis have all taken Nelson's songs to the top of the country music charts, and the smash, "Daddy Never Was the Cadillac Kind," earned him Million Airplay status in 2002. Chris Wallin has enjoyed his share of songwriting chart success as well: his recent "Something to Be Proud Of" kept Montgomery Gentry at number one for weeks. His songs have appeared on albums by everyone from Trace Adkins to Confederate Railroad and Diamond Rio. Though he's previously made a name for himself among Nashville's elite, Greg Shirley is happy to call Alabama his home. Performing to fans throughout his adopted home state, he has built a loyal following that recognizes him as one of their own. Pretty impressive roots for someone "raised on the run."